← The Word of YaHuWaH for 12-25-13 (Christ Mas Witchcraft) Elijah vs Baal. The Leopard was always indicative of the Moon. Leopards hunt at night and were considered Dark Lords. In the Mayan culture they represented the Bacabs or Four Beasts that held up the four cardinal directions of the Universe, hence the four heads. The panther has also been attributed to “Jesus”. In the Abodazara (early Jewish commentaries on the scriptures), it is listed as a surname for the family of Joseph. It tells how a man was healed “in the name of Jesus ben Panther.” Because of this, the panther often signals a time of rebirth after a period of suffering and death on some level. This implies that an old issue may finally begin to be resolved, or even that old longstanding wounds will finally begin to heal, and with the healing will come a reclaiming of power that was lost at the time of wounding. Likewise, In the myths and stories of Dionysus, the panther is a symbol of unleashing desires, and thus the awakening of the kundalini forces. The panther symbolized a time of moving from mere poles of existence to a new life without poles or barriers. The panther in a Dionysic manner awakens the unconscious urges and abilities that have been closed down. It signals a time of imminent awakening. 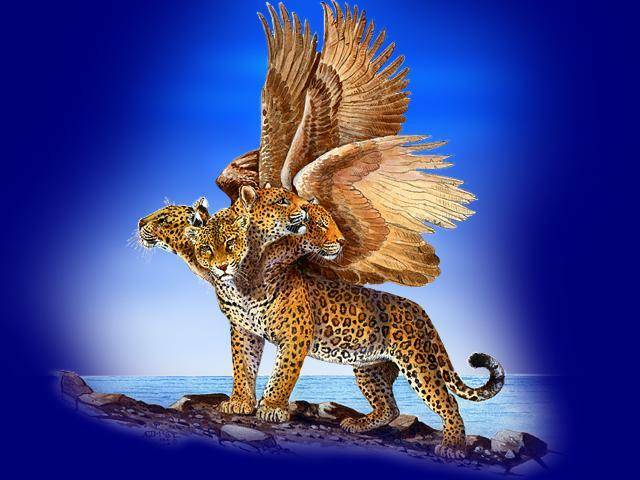 The jaguar is also said to have the ability to cross between worlds, and daytime and nighttime represented two different worlds to the ancients. The living and the earth were associated with the day, and the spirit world and the ancestors were associated with the night. As the jaguar is quite at home in the nighttime, the jaguar was believed to be part of the underworld; thus, “Maya gods with jaguar attributes or garments were underworld gods”. One such god was Xbalanque, one of the Maya Hero Twins who descends to the underworld, and whose entire body is covered with patches of jaguar skin. Another is God L, who is “the primary lord of the underworld” and often is shown with a jaguar ear or jaguar attire, and atop a jaguar throne. We all know that “Jesus” also descended to the underworld and conquered death and hell while there, and got the keys back from that kingdom of darkness. No doubt, the jaguar’s brilliant coat made it quite desirable, however, not all were allowed to don the jaguar pelt as it became the identification of the ruling class for the Maya. Not only did Maya kings wear jaguar pelts, but they also adopted the jaguar as part of their ruling name, as a symbol of their might and authority. One such ruling family to incorporate the jaguar into their name was known as, Jaguar Paw, who ruled the Maya city of Tikal in the fourth century. Other Maya rulers to incorporate the jaguar name included, Scroll Jaguar, Bird Jaguar, and Moon Jaguar, just to name a few. In addition to the ruling class, the jaguar also was associated with warriors and hunters. Those who excelled in hunting and warfare often adorned themselves with jaguar pelts, teeth, or claws and were “regarded as possessing feline souls”. The direction associated with this beast is the SOUTH. The rulers of the SOUTH. This is the sign correlating with Shamanism and shape shifting. Apoptosis in the case of the bodily Resurrection of the Messiah, along with transfiguration in other cases such as seen with Moses and Elijah. One more beast to go… The WESTERN BEAST….The worst of all! Posted on December 29, 2013, in Bible Figures, Book of Revelation, Illuminati, Resurrection, Sorcery, The Mazzaroth and tagged Daniel Chap 7, Daniel's third beast the Leopard, Dionysis, Jesus and Leopards, Mayan Jaguar gods, Pan Thera, The Leopard and the Moon. Bookmark the permalink. Comments Off on The Four Beasts of Daniel Chap 7. Beast # 3- The JAGUAR/LEOPARD/PANTHER.